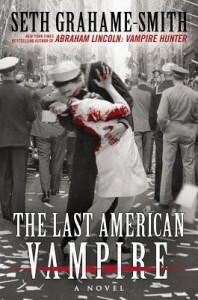 The Last American Vampire takes up from where Abraham Lincoln, Vampire Hunter ends, but I don't think it's necessary to have read the first book prior to this. There are references to the first book, but LAV takes the reader in a different direction. Where Lincoln basically covered the years of the president's youth and administration, LAV is a more ambitious work and spans the post-Civil War to nearly the present day, with the possibility of a third book if that's how you interpret the ending. Henry Sturges is a vampire created during the first English settlement of the New World, and his life is a "Forrest Gump"-style panorama of adventures, in that he connects with many of the noted people in their respective eras. We find a few of history's greatest mysteries and tragedies are actually attributed to vampire involvement. I liked ALVH, but I think I enjoyed this book more because with the expanded time gaps there's more to do. When you discover Henry's prime nemesis it's rather clever how that ties into specific events. It's a horror in the gory sense, though. Some very bloody scenes.